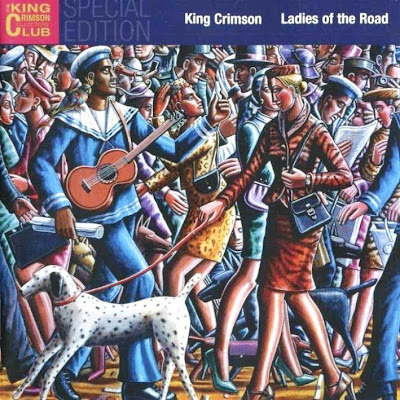 Ladies of the Road (Discipline Global Mobile, 2002) is a two-volume compilation of live performances during 1971-1972 drawn from the archives of the King Crimson Collectors' Club. The sound quality is superior than the original KCCC releases but on CD one "Formentera Lady" [from Live in Detroit] is abridged from 9:15 to 6:41 and "In the Court of the Crimson King" [from Live in Detroit] ends abruptly after only 0:48 without any warning. It wasn’t made for a capability problem due a regular CD offers enough space to fit both tracks on its original length. Also, on CD two, the eleven track of "Schizoid Men" appears dreadfully chopped and then another "Schizoid Men" hidden track emerges with the same unpleasant effect. So undoubtedly it was made thanks to a kind of "Earthbound" Fripp's decision and, again, it damages the pleasure of listening. So we have rescue both tracks on its entirely length for the first CD and fade out both ends on the eleven track which now ends gently.